Tens of thousands of people waving Spanish flags joined a rally on Sunday (10 February) in Madrid called by right-wing and far-right parties against Prime Minister Pedro Sánchez, who they accuse of treachery over his negotiations with Catalan separatists. Police said around 45,000 people packed Colon Square and surrounding streets for the event, which came just two days before the high-profile trial of Catalan separatist leaders opens in Madrid over their role in Catalonia’s failed 2017 independence bid. Organisers said over 200,000 people took part on the rally held under the slogan “For a united Spain. Elections now!”. Under the shadow of Colon Square’s huge Spanish red and yellow flag, demonstrators bussed in from all over the country heard speakers call for the defence of Spanish unity. Many waved Spanish and European Union flags or held up signs reading “Stop Sánchez. Elections now!”. The rally was called by centre-right Ciudadanos, the conservative Popular Party (PP) and far-right Vox, which has only recently burst onto Spain’s political scene, as well as a handful of smaller far-right groups. They are angered by Sánchez’s decision to take a more conciliatory tone with pro-independence parties, whose votes are crucial to the legislative agenda of his eight-month-old minority government, saying it amounts to “treason”. 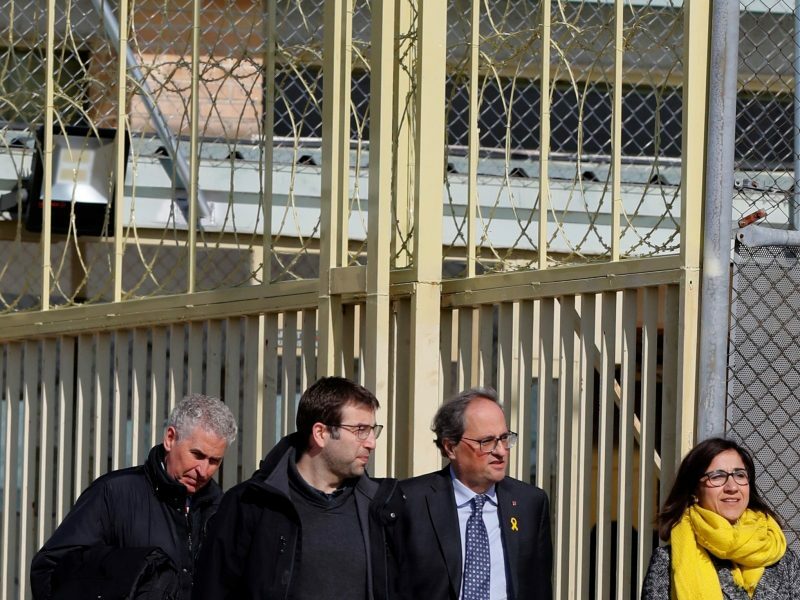 Far-right Spanish party Vox is on track to get a global soapbox as it takes part in the much-hyped trial of Catalan pro-independence leaders as a “popular prosecutor” — a Spain-specific legal mechanism that has left Madrid embarrassed. “The government of Sánchez’s time is up,” PP head Pablo Casado told reporters before the start of the rally. 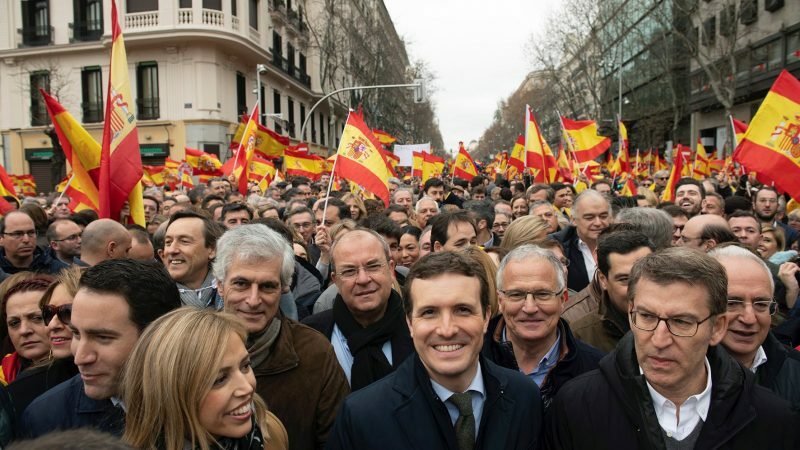 “We are here to say no to separatism and yes to Spain,” added Ciudadanos leader Albert Rivera. Sánchez, who came to power in June with the support of Catalan nationalist parties, defended his government’s attempts at dialogue with Catalonia. “The government of Spain is working for the unity of Spain,” he told a party rally in the northern city of Santander. Elena Navarro, who attended the anti-Sánchez rally in Madrid with her teenaged son, said Sánchez was “a traitor”. “He is making pacts with our enemies, with people who have caused us great harm and want to divide Spaniards,” the 45-year-old told AFP. Conservative parties called the rally after Sánchez’s government last week accepted the presence — as requested by Catalan separatists — of an independent “rapporteur” in future talks. Despite the government’s concession, Catalan separatist parties still refused to back the government’s 2019 budget and both sides on Friday called off their talks, with each side blaming the other for ending their dialogue. If Sánchez is unable to approve his budget, he could call elections before his term is over in 2020. Ana Guisasola, a 50-year-old who works for a motor lubricants firm, said she had voted for the PP and Ciudadanos in the past, but now plans to vote for Vox, which she called Spain’s “last hope”. “I want someone who will grab a broom so that Spain can move forwards,” she told AFP at the rally.